FRSTeam by Lansing Cleaners is proud to be a part of the nation's leading fabric restoration group. We take great pride in serving the people of Illinois, as well as Indiana with the highest levels of quality and customer service. Call us now at (708) 474-2459. To submit a claim online, click here. As part of FRSTeam, a growing group of national fabric restoration specialists, Lansing Cleaners is focused on loss mitigation and delivering unprecedented value, using specialized technology and personal touch to restore happiness. 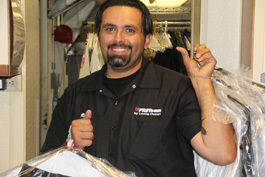 Through FRSTeam, Lansing Cleaners maintains its commitment to the restoration and insurance industries by continually researching and innovating restoration solutions, from dry cleaning to laundry, from odor removal to mold remediation, then investing in the right equipment to get the job done for you. If you have a claim or any questions, call us 24 hours/day at (708) 474-2459. To submit a claim online, click here.